It’s becoming increasingly difficult to write about Celer’s music. The duo’s output has been coming our way at a steady rate in recent months and their music seems to be converging on the extremes of ambient fragility. Far away from the more usual drone recordings that come our way, Celer’s music is incredibly bold in its gentleness and the demands it makes on you as a listener. There’s a lot going on over the course of this forty minutes, and to get the most out of it you’ll have to tune in carefully, but even the most casual level of exposure to this music seems to slow down time. The dynamic range stretches between quietness and lulled imperceptibility, wafting in and out of earshot unless you really crank the volume and it’s this coquettish, elusive quality that makes Celer so magical, and places them on a different plane to most other practitioners currently operating in a similar field. While comparisons to Stars Of The Lid and Stephan Mathieu have previously been thrown around these pages, the sheer enigmatic stillness and overwhelming ambiguity of this music makes them a whole other prospect. Highly recommended, as ever. Celer have a tireless work ethic. “In Escaping Lakes” was one of nearly a dozen albums released by the duo in 2009, and they currently have a number of 2010 releases to their name as well. In their apparently enduring effort to make the quietest ambient drone possible, they have crafted an album to match the minutiae of life– gentle breezes and flowing streams whispering tales of the Earth that span millions of years. Time becomes imperceptible in the midst of the slow drones on “In Escaping Lakes.” The piece, roughly forty minutes, is comprised of a handful of smaller movements. Everything moves at a languid pace, slowly gliding along, never deviating from its uniform ambient wanderings. The collected piano, gong, strings, electronics, flutes, and more all come together in an act of audio osmosis, seamlessly forging a beautiful whole from the parts of many. It’s difficult to write a review for such an ephemeral piece of music. The drones here seem to fade into existence, and then vanish just as quietly as they came. “In Escaping Lakes” is certainly beautiful, but its opacity demands a lot from the listener. We’ve had a number of Celer releases in lately and some of you just can’t get enough of their mellow ambient ways. Though I’ve just started to listen to this new CD ‘In Escaping Lakes’ which has just arrived from Japan and some knobhead has started drilling next door which is totally ruining the ambient chi….. I’m not really sure what you can say about a new Celer record that hasn’t been said before? All the ones I’ve heard prove them to be masters of drifty ambient drone. The music takes you to special places and despite this being a popular thing to be doing right now they stand head and shoulders above the rest. It’s really quite good. I listened to Brittle a couple of days ago at home and it was a thoroughly gorgeous way to spend an hour or so. In Escaping Lakes will do the same….. it will take you on an introspective ambient journey and leave you feeling well special at the end of it. Well special (again)! CD only on Slow Flow Records in nice foldy cardboard thing. In Escaping Lakes breathes serenely for forty minutes, one of those Celer recordings that blends into the surrounding atmosphere when played sans headphones yet also rewards closer listening when heard with them. The subtly calibrated spatial movements of the work’s tones are more clearly noticed via headphones, for example, as are the transformations in the tones themselves, which range from clearly defined and blurry to warbling and whistling. Though the recording is indexed to play as a single, uninterrupted piece, the multiple individual sections listed on the sleeve—“A Less Distinguished Tributary,” “Seagrass,” “Mentioned Fumes,” “The Light Obtainable In Spaces We Share,” etc.—reflect the constantly changing nature of the recording. The transitions between the sections are handled so understatedly, however, that the differences between sections are experienced more subliminally than explicitly. In short, In Escaping Lakes, which Will and Dani produced using hydrophone, strings, gong, tingsha bells, electronics, flute, and piano, might be described as an extended murmur of tranquil design. 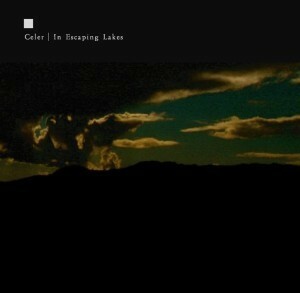 Like a whisper stretched out interminably, Celer’s recording is analagous to Douglas Gordon’s 24 Hour Psycho (the 1993 work slows Hitchcock’s 1960 film so that a single, continuous viewing of the film require twenty-four hours) in that both slow their respective materials down until they seem almost frozen in time. Celer, project of the husband and wife duo of Will Long and Danielle Baquet-Long continues its’ releases after the death of Danielle. In Escaping Lakes is a one track release which acts as a sequel to Cursory Asperses, in that this release deals with lakes, enclosure, depth and closeness whereas the former examined the slow movement of streams. It comprises of the use of piano, strings, gong, tingshas, voice, electronics, hydrophone and flute, the recordings of these instruments and the slowed down , extended merged. It can be considered akin to a drone musical form or perhaps as an examination of discrete tonal change and variation within a sense of a seamless whole. Even the variation between indexed sections is as nebulous to be moot if demarcation can be drawn. Is the stream the lake? The duos technique draws from analogue tape recording and loop manipulation and then the movement of fragments into digital editing. The analogue tape ‘warmth’, or sound familiarity in a historical sense of the idea of recorded sound, forms a good deal of the emotional content that could be derived from this release. Also the notions of it sensual aspects, in that it is deeply contextual to environments, seems to be aided by this practice. Regardless of the veracity of the analogue as being a closer approximation of the natural, it is the developed familiarity with the technology that codifies the representation of the natural in sound. In that we hear the historical landscape of sound utterances and their representational capacity is in as much as Celer can paint a landscape, In Escaping Lakes, in sound.